Removal of Pb(II) from Aqueous Solutions by Zeolites. 1Department of Biology, Chemistry and Environmental Sciences, American University of Sharjah, Sharjah, United Arab Emirates. 2Department of Geology, The University of Jordan, Amman, Jordan. Chemical compositions of natural zeolites, porcelanite (opal-CT) and local sands were determined by X-ray fluorescence (XRF) and correlated with their Pb(II) removal efficiencies. Zeolites and porcelanite were from the Mikawer, Aritain and Hannon areas in Jordan. Sands (white, red and yellow) were from the United Arab Emirates (UAE). The effect of Pb(II) concentration and zeolite dosage on removal efficiency was investigated at 25.0°C using the batch equilibrium method. Commercial kaolinite, silica and alumina were also studied for comparison. Removal efficiencies, in mg Pb(II)/g adsorbent, were: 76.9, 52.7 and 42.1 for Hannon, Mikawer and Aritain zeolites, respectively; 58.2 for porcelanite; 29.7, 11.0 and 8.5 for yellow, red and white sand, respectively; 7.2, 3.3 and 1.3 for kaolinite, silica and alumina, respectively. XRF data indicate that adsorbents with intermediate molar ratios of Si/Al, in the range 2.70 – 2.93, are most efficient in Pb(II) removal. Scanning electron microscope (SEM) images of adsorbents suggest that morphology, in addition to chemical composition, plays a key role. In particular, a combination of factors, including shapes and sizes of crystals, channels in zeolites and pores in porcelanite, appear to favor removal of Pb(II). 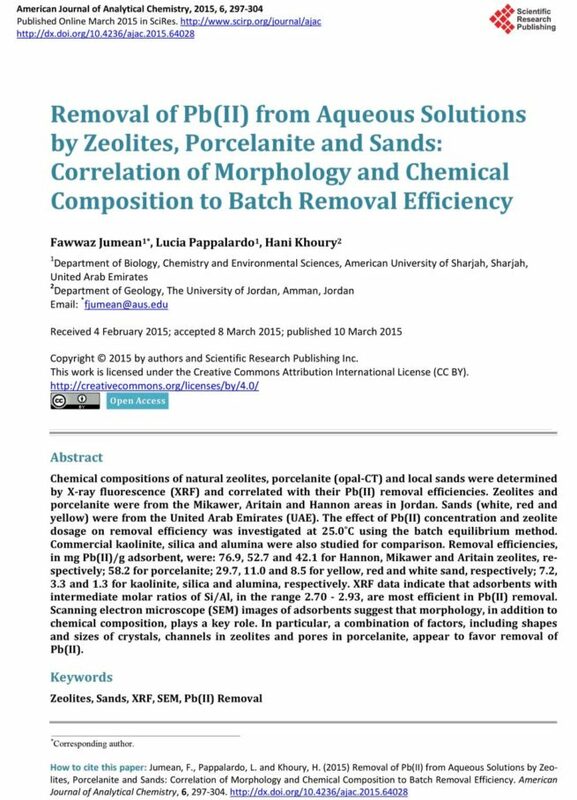 Jumean, F. , Pappalardo, L. and Khoury, H. (2015) Removal of Pb(II) from Aqueous Solutions by Zeolites, Porcelanite and Sands: Correlation of Morphology and Chemical Composition to Batch Removal Efficiency. American Journal of Analytical Chemistry, 6, 297-304. doi: 10.4236/ajac.2015.64028. Pappalardo, L., Jumean, F. and Abdo, N. (2010) Removal of Cadmium, Copper, Lead and Nickel from Aqueous Solution by White, Yellow and Red United Arab Emirates Sand. American Journal of Environmental Sciences, 6, 41-44. Pappalardo, L., Jumean, F. and Abdo, N. (2011) Removal and Recovery of Lead from Aqueous Solution by Low Cost Media. American Journal of Environmental Sciences, 7, 141-144. Khamis, M., Jumean, F. and Abdo, N. (2009) Speciation and Removal of Chromium from Aqueous Solution by White, Yellow and Red UAE Sand. Journal of Hazardous Materials, 169, 948-952. Jumean, F., Khamis, M., Sara, Z. and AbouRich, M. (2015) Concurrent Removal and Reduction of Cr(VI) by Wool: Short and Long Term Equilibrium Studies. American Journal of Analytical Chemistry, 6, 47-57. Bulut, Y. and Tez, Z. (2007) Removal of Heavy Metals from Aqueous Solution by Sawdust Adsorption. Journal of Environmental Sciences, 19, 160-166. Park, H.J., Jeong, S.W., Yang, J.K., Kim, B.G. and Lee, S.M. (2007) Removal of Heavy Metals Using Waste Eggshell. Journal of Environmental Sciences, 19, 1436-1441. Kolemen, S., Arcali, N., Tugrul, N., Derun, E. and Piskin, S. (2013) The Zinc Adsorption Study by Using Orhaneli Fly Ash, Bentonite, and Molasses in Wastewater. Water, Air & Soil Pollution, 224, 1-10. Yang, J., Lee, J.Y., Park, Y., Baek, K and Choi, J. (2010) Adsorption of As(III), AS(V), Cd(II), Cu(II), and Pb(II) from Aqueous Solutions by Natural Muscovite, Separation Science and Technology, 45, 814-823. Kim, J.S., Zhang, L. and Keane, M. (2001) Removal of Iron from Aqueous Solutions by Ion Exchange with Na-Y Zeolite. Separation Science and Technology, 36, 1509-1525. Zhu, Z., Li, L., Zhang, H., Qiu, Y. and Zhao, J. (2010). Adsorption of Lead and Cadmium on Ca-Deficient Hydroxyapatite. Separation Science and Technology, 45, 262-268. Shukla, S.R., Giakar, V.G., Pai, R.S. and Suryavanshi, U.S. (2009) Batch and Column Adsorption of Cu(II) on Unmodified and Oxidized Choir. Separation Science and Technology, 44, 40-62. Sdiri, A., Higashi, T., Hatta, T., Jamoussi, F. and Tase, N. (2011) Evaluating the Adsorptive Capacity of Montmorillonitic and Calcareous Clays on the Removal of Several Heavy Metals in Aqueous Systems. Chemical Engineering Journal, 172, 37-46. Camacho, L.M., Deng, S. and Parra, R.R. (2010) Uranium Removal from Groundwater by Natural Clinoptilolite Zeolite: Effects of pH and Initial Feed Concentration. Journal of Hazardous Materials, 175, 393-398. Shavandi, M.A., Haddadian, Z., Ismail, M.H.S., Abdullah, N. and Abidin, Z.Z. (2012) Removal of Residual Oils from Palm Oil Mill Effluent by Adsorption on Natural Zeolite. Water, Air & Soil Pollution, 223, 4017-4027. Khoury, H. (2006) Industrial Rocks and Minerals in Jordan. 2nd Edition, University of Jordan Press, Amman. Yousef, R., El-Eswed, B., Alshaaer, M., Khalili, F. and Khoury, H. (2009) The Influence of Using Jordan Zeolites on the Adsorption, Physical, and Mechanical Properties of Geopolymers Products. Journal of Hazardous Materials, 165, 379-387. Khoury, H., Ibrahim, K., Ghrir, A. and Ed-Deen, T. (2003) Zeolites and Zeolitic Tuff in Jordan. University of Jordan Press, Amman. Somerset, V.S., Petrik, L.F., White, R.A., Klink, M.J., Key, D. and Iwuoha, E. (2004) The Use of X-Ray Fluorescence (XRF) Analysis in Predicting the Alkaline Hydrothermal Conversion of Fly Ash Precipitates into Zeolites. Talanta, 64, 109-114.